Supercritical fluids and dense gases are a unique class of non-aqueous media with many features that make their use as solvents for biocatalysis and separation particularly desirable. The advantages of supercritical fluids as solvents fall into four general categories: environmental, process, chemical and health/safety. Other attractive features of supercritical fluids as solvents for biocatalytic processes include their high diffusivities, low toxicity and environmental impact, easy downstream processing and recyclability. Application of dense gases as “green solvents” for biochemical reactions is not yet realized on industrial scale. The reason might be instability and deactivation of enzymes under pressure and temperature. 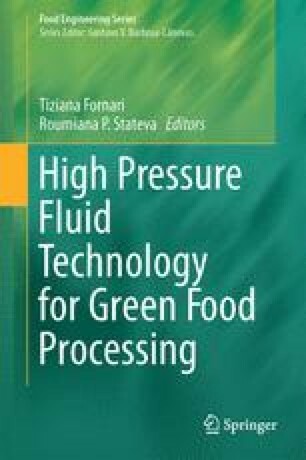 The Chapter outlines the main factors influencing enzyme activity and stability and the process parameters impact on reaction rates and productivity, on application of various types of reactors, and on limitations of enzymes applications as biocatalyst in supercritical fluids. Future trends of development are presented as well.